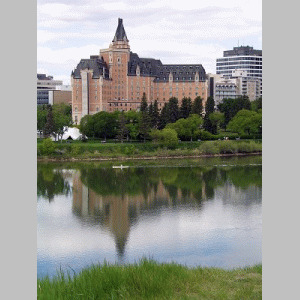 Click here to book from a selection of Saskatoon hotels. Book accommodations in the prettiest prairie city, Saskatoon, and discover why so many visitors return again and again; some never leave! Saskatoon has the best air and water quality in Canada, friendly residents and, to top it off, is situated on the picturesque banks of the South Saskatchewan River. The Meewasin Valley trail, running 21 km (13 mi.) alongside the river and through the heart of the city, is often full of joggers and cyclists enjoying the scenery. Life is certainly not dry in this prairie town! Learn about the days of pioneer settlement at the Western Development Museum's impressive 1910 Boomtown. Waneskewin Heritage Park, situated on the river, is a sacred cultural site and interpretive center honouring 6000 years of First Nations history. Nearby Batoche is the place to relive the saga of Louis Riel, and view the fully restored church, rectory and battlegrounds of the Metis' final skirmish with the English. If history isn't your thing, try Kinsmen Park rides and outdoor pool, Beaver Creek wildlife site, the Saskatoon Zoo and Forestry Farm, or the Marquis Downs races. Experience Saskatoon's buzzing cultural life at Folkfest, Shakespeare on the Saskatchewan, or the Saskatoon Symphony. Whether you are a history buff, a culture fan, or an outdoor enthusiast, there is definitely something for you to love about Saskatoon! Book accommodations in the City of Bridges today, and discover what all the talk is about. We are a gem in the heart of Saskatoon. Established in 1958, we grace the South Saskatchewan riverbank along the Meewasin Trail. Many of our guests comment that our hotel is one of the best hotels in Saskatoon. This 3 ½ star property is privately owned by local shareholders committed to maintaining our excellent reputation for providing the highest standards in service and product. Located in the heart of downtown Saskatoon, you'll enjoy our stunning riverbank location, caring and attentive staff, and comfortable guest rooms. The kids will love our indoor water park. Explore tree-lined walking and hiking trails as well as local shops and museums. Host a great event in our meeting and conference facilities, including Saskatoon's only rooftop ballroom, The Top of the Inn. This Saskatoon hotel is located 3 miles from Saskatoon John G. Diefenbaker International Airport. and features an indoor pool with a 250-foot water slide and rooms with cable TV. Guest rooms provide free Wi-Fi, seating areas and desks. They are furnished with microwaves and refrigerators and also include coffee makers and hairdryers. The hotel offers guests an on-site restaurant and room service. Our downtown Saskatoon hotel near Midtown Plaza and Saskatoon TCU Place offers the kind of warm hospitality, inviting atmosphere and top notch services sure to please business and leisure travelers alike. This Saskatoon hotel features an indoor Golf Dome with driving ranges and a mini-golf course. The hotel is 3 km from the University of Saskatchewan and provides an indoor pool. The rooms at this hotel are furnished with a microwave and a refrigerator. The rooms also include coffee facilities. Guests can have a drink at Mulligan’s Sports Lounge or at The Long Branch, a country bar. This motel in Saskatoon, Saskatchewan offers free wireless internet throughout the building. The hotel also features modern facilities such as an indoor pool and coin laundry facilities. Guests will also enjoy coffee and donuts at Tim Hortons restaurant, which is located next door. Guests can also attend an event at the nearby Saskatoon Centennial Auditorium & Convention Center. This hotel is 5 km from downtown Saskatoon and 3 km from Saskatoon International Airport. It features classic rooms with free Wi-Fi and a cable TV. A coffee maker and work desk are standard in every simply designed room. All rooms include a private bathroom and a telephone with free local calls. Mendel Art Gallery and the Mall at Lawson Heights are both a 10-minute drive from the hotel. Featuring 2 indoor pools and a 250-foot waterslide, this Saskatoon hotel provides free Wi-Fi. A restaurant, a bar, and a lounge are on site. Saskatoon Airport is just a 4-minute drive away. A flat-screen cable TV is available in each air-conditioned room at this hotel. A microwave and a refrigerator are included. The private bathroom provides free toiletries.